The First Minister is to discuss oil, whisky and golf during peace trip to China in order to improve relations between the two countries. Whisky, golf and oil are high on the agenda for First Minister Alex Salmond as he continues his visit to China. Mr Salmond welcomed drinks firm Diageo, showcasing their Johnnie Walker whisky brand, and the Ryder Cup golf trophy to Beijing to promote two of Scotland's most famous exports to the Chinese market. The First Minister is in China for discussions with the government to strengthen ties and trading between the two countries. He will introduce Scottish oil and gas firms to senior managers from Chinese energy giants CNOOC and Sinopec to sell Scotland's innovation and expertise. Mr Salmond said: "Scotland's national drink is renowned across the world and Scotland is the undisputed home of golf, so it is great to see global brands like Johnnie Walker and The Ryder Cup joining up to bang the drum for our greatest exports. "The love for Scotch whisky in China continues to grow. In 2012, exports to China were valued at £71.5m representing a 70% increase since 2007 and the presence of such a fantastic, iconic venue as Johnnie Walker House in Beijing is a true testament to that popularity. "The Ryder Cup at Gleneagles next year is one of Scotland's many opportunities to shine on a global stage." Johnnie Walker global brand director Gavin Pike said: "Just as Johnnie Walker blends Scotch Whisky from the four corners of Scotland and takes it to the four corners of the world, so The Ryder Cup projects golf to an international audience. "We continue to see tremendous growth potential in Scotch Whisky and we know that The Ryder Cup and golf are also eliciting great interest here in China." 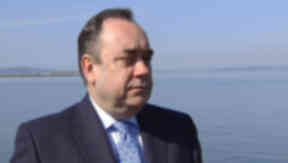 Mr Salmond added: "As the world's most populous country and one of its fastest-growing economies, China is exploring new domestic energy supplies and investing heavily in the industry through mergers and acquisitions overseas. "Scotland's enviable reputation as the European capital of oil and gas, and our ongoing pioneering work in exploration and extraction, gives us a strong appeal to Chinese firms looking for both domestic and international future energy supplies. "In the past few years we've seen increased investment from China into the industry in Scotland, with CNOOC's acquisition of Nexen, and Sinopec's interest in Talisman's North Sea business. "And this week, I'm introducing some of our most innovative companies to the senior leadership of these energy giants, to help them do more business in this market. "This approach is clearly paying off, with the very welcome announcement today that Dundee-based SafeHouse Habitats has secured a £150,000 contract with CNOOC to provide its expert safe working environment services in the Chinese market." Julian Taylor, Asia Pacific director at Scottish Development International, said: "China already owns 20% of the world's oil and gas operations and continues to look for opportunities in Africa and South America. Given Scotland's growing experience of success in these markets, there are clear opportunities to benefit from this investment-ready environment by partnering with China's oil companies."